Wedding season is arriving fast and can you make a guess what we are excited for…. bridal jewelry! With wedding season right around the corner, it’s high time to start looking for your favorite bridal jewelry. With innumerable options available in the market, chances are more that you might get confused and find yourself stuck in the middle of nowhere. To clear the air of confusion, Tashiara comes up with top bridal jewelries that are setting the ramp on fire. So, dear brides get ready to take the inspiration from our curated list that is straight from the red carpet. Pearl and Polki: If you are dreaming of a wedding like Indian Rajkumari then polki jewelry can turn your imagination into reality. Polki symbolizes love, memories and emotion making it ideal for the wedding day. 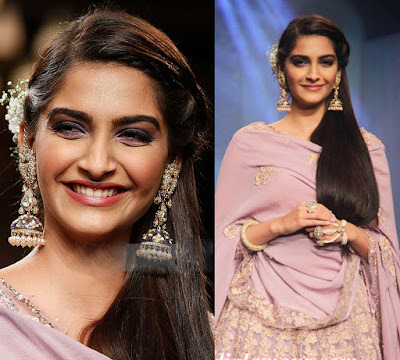 You can get the inspiration from Sonam Kapoor wearing giant jhumkhis in pearl and polkis with Cocktail Ring, Kada and Haath Phool in the below image. Kundan Set: Another bridal jewelry that will do justice to your attire is kundan set. But, make sure you wear just one heavy kundan set if your wedding outfit is embellished with heavy work. However, if your wedding outfit is plain with not much of bling, then you can opt 2-3 necklaces to give your traditional dress a heavy look. 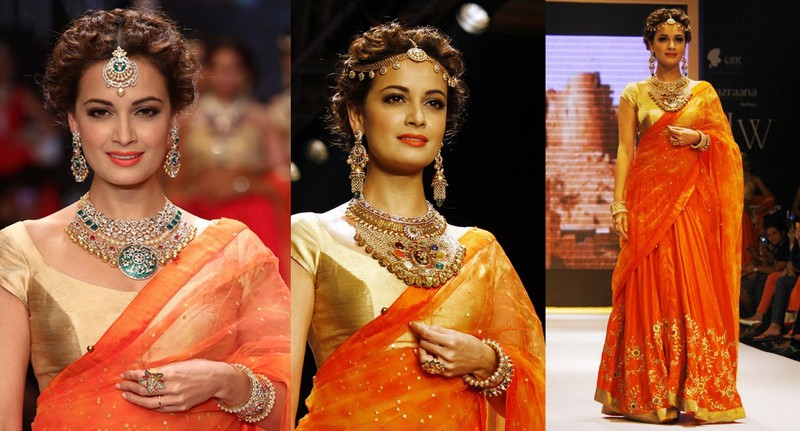 Dia Mirza in the recent fashion show showcased a modern bride with subtle makeup but appealing features. She is wearing the ‘U’ shaped Rani Haar, draped gold beaded necklace, maang tikka, cluster of bangles, earrings, kada and paisley pendant at the center of a neckpiece was the statement maker. If you are looking for something different from the traditional maang tikka, why not steal the look from the model that she flaunted on the below image. Headpiece is one of the best options to add a contemporary touch to your overall traditional look. Want to look and feel like a princess on your D-Day? If yes, you must opt for elaborate necklace designs. These necklaces are generally large in sizes, just 1 piece of this style is enough to give you a royal look. It comes with no surprise that diamonds are girls’ best friends. 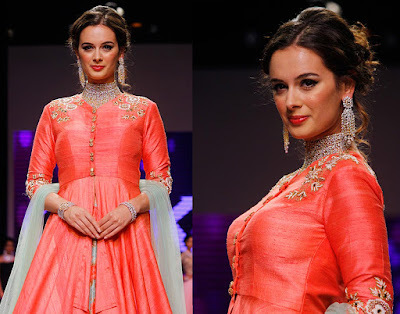 You can go for an elaborate diamond necklace with matching earrings like Evelyn Sharma, especially if your dress has a low neckline. 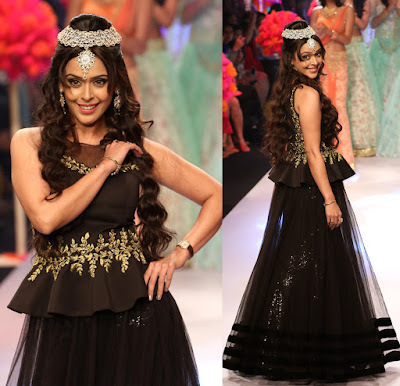 Rani Haar: Undoubtedly, you will feel like a princess (rani) after wearing the Rani Haar on your D-Day. Whether your dress is heavily embellished or slightly plain, pair your dress with a Rani Haar to look extremely elegant and royal. If you don’t want to wear a hanging necklace like other brides, then you can go for a choker necklace to add an oomph factor to your personality. If you also know some top bridal jewelry ideas, please don’t forget to share with us. Your comments will be appreciated.